Tornadoes are on the minds of many Windsorites, Leamingtonians and citizens of Essex County after a destructive F1 tornado ripped through Harrow and Leamington on Sunday morning. Where have Tornadoes struck Windsor before, and how frequently do storms of varying magnitudes hit Essex County? During the early evening of June 17th, 1946, a serious tornado originated in the area of River Rouge / Zug Island, Michigan. The funnel crossed the Detroit river, roughly followed the path of Turkey Creek (Grand Marais Ditch), dissipated and reformed with incredible severity in the area of Walker Rd. and Grand Marais (presently where the new rail underpass exists). The tornado tracked north of Windsor Airport, then began a northeasterly path toward Tecumseh smashing through neighbourhoods and eventually meeting its end over Lake St. Clair. The “F4″ tornado was arguably one of the worst to strike Canada. Seventeen people lost their lives, houses were demolished down to their foundations, the printing plant for the Windsor Star was taken out, and brief panic set in amongst Windsorites: leading to looting, crime and civil unrest. On April 3rd, 1974, an outbreak of severe weather struck various parts of the United States. Nearly 150 tornadoes were confirmed between Mississippi and Ontario, which lead to over three hundred deaths. 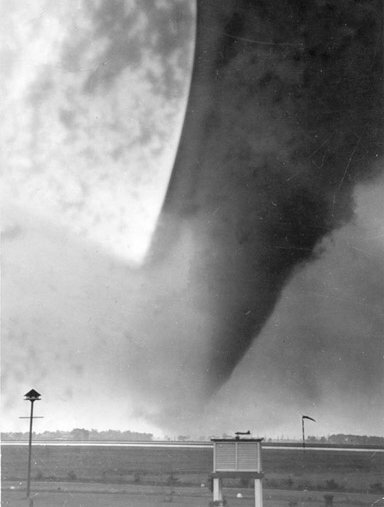 During the evening, a tornado formed in Flat Rock, Michigan, crossed the Detroit river, reformed near River Canard, dissapated and the storm continued toward Windsor. The tornado was first reported as having struck the south parking lot of Devonshire Mall, then continued toward Walker and Grand Marais (where the 1946 tornado struck). It damaged Chrysler Canada’s painting plant and continued toward Central Avenue. At ten after eight in the evening, the Tornado struck the Windsor Curling Club on Central, shearing off the metal roof, and collapsing a cinder block wall which killed nine people inside and injured more than thirty. The path of the tornado was reported to have measured over 300 metres in width. Environment Canada maintains a detailed list of tornadoes that have struck various parts of our Country. By isolating tornado reports from 1919 – 2003 to our geographic region, we were able to produce this Google Map of recorded tornado strikes from Windsor to Leamington, and Amherstburg to Lakeshore. Check it!